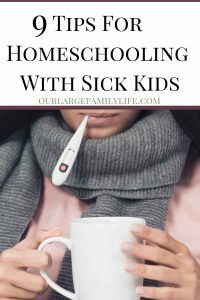 Homeschooling during sickness is probably one of the biggest issues we face when it comes to staying on track. Winter is notorious or synonymous with sickness, especially with a large family. Once we catch something (no matter how hard I try to avoid it), it usually means a minimum of a week, but most likely two before it has gone through everyone and we can resume a normal schedule. Of course, we know we can’t take two weeks off of school because it is likely that that will not be the last thing we catch all season. So we have to make a plan for how to deal with sickness. When is there no school? Determine what to what degree of sickness means no school. Stocking up before the sickness comes on medicine and food you will need will make for a lot less stressful time. Running to the store will pretty much throw off any plans to get anything done. Make sure you have pain relievers, cold and cough medicine, vitamins, crackers, applesauce, and soup on hand will allow you to help those who are sick, along with keeping the other kids going. I love reading aloud to my kids. I wish they loved it as much as I do. But if you’ve got a couple who are down, it may be a great day to have everyone cuddled in the living room to hear a good biography or historical fiction. These kinds of books can create some great discussion and it won’t feel very much like school for them. This is also a good plan when mom is tired from possible being up all night with sick kids. Being able to just sit, read, and discuss with everyone will be a lot easier than all the individual work. You could also play an audiobook for everyone to listen to. My kids love anything on PBS. Most online streaming services have a good selection of documentaries, and then, of course, the magic school bus. Maybe you have some videos you bought and never got around to, or there are supplemental videos that came with your curriculum that is tough to make time for. These are especially great options for when mom gets sick. Homeschool in the afternoons and evenings. Switch around the time school happens. Do it during naptime or whenever sick kids fall asleep or when your spouse comes home in the evening. You could do videos during the morning and then book work when help comes home. Board games are a great way for kids to learn while they play. Many games for younger children have math components such as counting. Games geared towards older children and adults have that have strategy, help kids to understand logic. Have your children make up their own games based on recent school work, or make them game show themed. Puzzles are a great activity for kids to do while sick or well. If you’ve got kids who are resting this is a great activity to keep them occupied. Read aloud or have an audiobook going at the same time. It would also make a great activity for a child who doesn’t feel well to keep them occupied while you do school. Experiments could be an option while sick kids are resting if you have all the supplies. Some experiments are usually pretty hands on so it would make a good rest time activity or project for when your spouse gets home. This is another quiet activity that is good for kids to do on their own. You can find tutorials on Youtube they can follow along with or use drawing books. This is another great activity to have an audio book going on in the background. Sickness is an unavoidable part of winter. It can be especially hard when you are home with other kids who will need to do school as well. Have a plan in place of what to do when you find yourself with sick kids. This will allow you to still have a learning environment available for those who are not. It is also a great time to teach kids personal hygiene so they hopefully don’t catch all the things as well. Don’t want to forget these tips? Pin for later! 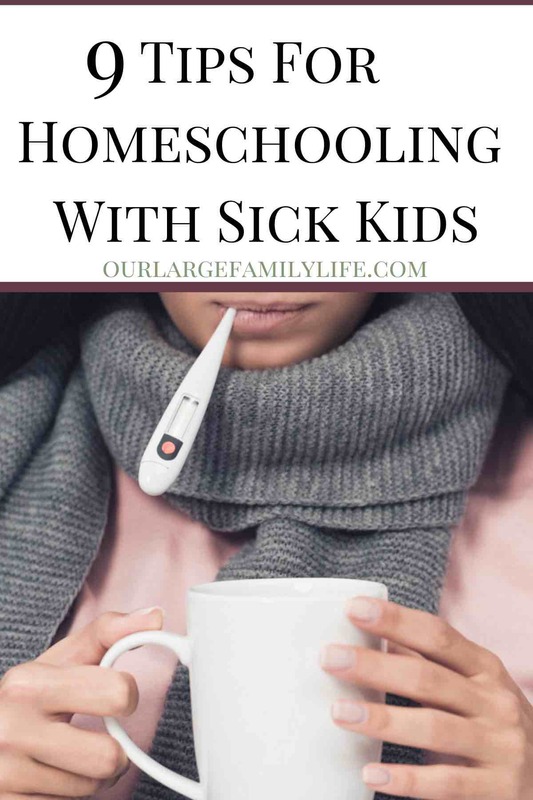 How do you get school done when your kids are sick?